My culinary career began as a Charter Boat Chef in the Virgin Islands. How I got there is an entirely different story. I was 23 years old and was not much of a cook OR a Chef; I had a lot of learning to do. My fellow galley slaves shared their knowledge and their books and recommended the two pictured below for best bets. The recipes featured in these cookbooks all came from seasoned Charter Boat Chefs who totally understand how challenging it is to cook 3 squares a day, plus appetizers and desserts for 8-12 people in a space the size of small bathroom. Yet another conundrum is the fact that over 50 boats are all vying for the freshest of produce, dairy, meat, booze, you name it. This is improvisational cuisine at its’ finest. Anyhoo…..I had a bunch of bananas turning brown and got a hankering to make some bread. The best recipe I’ve ever used for Banana Bread is in the original “Ship to Shore”, page 36. Yes, I remembered that. 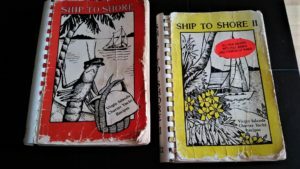 I’ve had these books with me for over 30 years. Food preparation, ingredients, method and technique have changed dramatically in all that time. But you really can’t mess with a solid Banana Bread. Enjoy! P.S. I lost my loaf pans in the move to Wallace, so I decided to make muffins….and then I mixed it up and made a cream cheese frosting. I guess you can mess with it, but it’s still pretty tasty. I use a kitchen-aid, but you can use beaters or a spoon. Cream the sugar and butter until smooth, add the eggs, one at a time and incorporate. Add bananas and vanilla and mix well. Mix in flour, baking powder and salt. Scrape the sides well. If using a loaf pan, greases and flour it and cook for about 1 hour. If using muffin tin, spray the paper cups with vegetable oil and cook about 45 minutes. Watch them closely, the high content of butter can make them burn quickly. Cream butter, cream cheese and vanilla until smooth. Slowly incorporate powdered sugar until you get the consistency you like. Posted in Heidi's Blog, Whassup' in WallaceLeave a Comment on Banana Bread from The Islands, Mon! 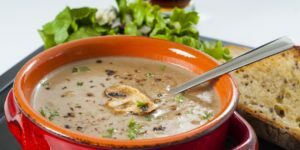 I was never a big fan of mushroom soup until I made it in Culinary School. This is my variation of the French Classic. Enjoy!! Put a stock pot over medium high heat. Add olive oil and butter. Sauté mushrooms, onion, and garlic until mushrooms begin to soften. Add thyme and stir into mix. Turn the heat to high and add the Sherry. Let it cook until almost dry then stir in heavy whipping cream and chicken broth. Stir cheese in several batches, until melted. In a small bowl, thoroughly mix cornstarch and cold water. Turn the heat up and while whisking, pour the slurry of cornstarch into the pot. Bring to a gentle boil. Simmer 2 minutes until thickened, taste for seasoning. Serve with a good crusty bread and a glass of an oakey Chardonnay.